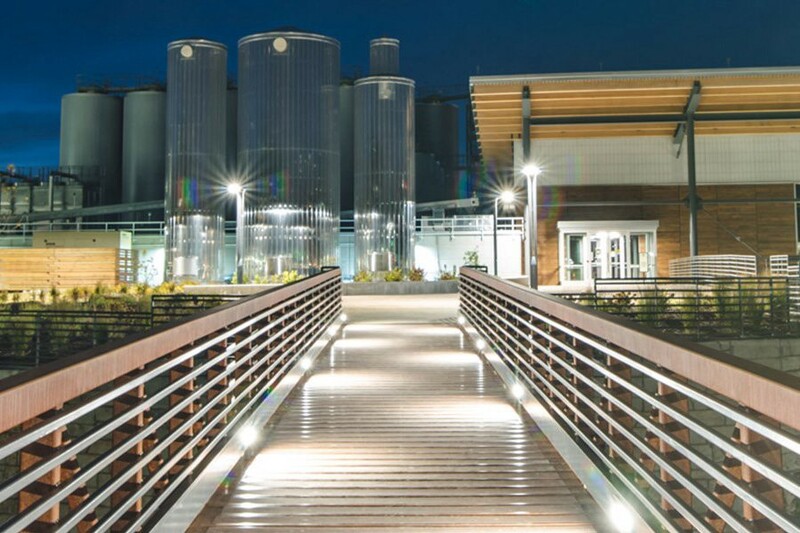 New Belgium’s brewery, in Asheville, North Carolina, is built on a former brownfield. The New Belgium Brewing Company began when a couple of Belgium beer enthusiasts, Jeff Lebesch and Kim Jordan, made beer in their Colorado basement. Their amber ale, Fat Tire, was so popular that they decided to produce it commercially in 1991. Since then New Belgium has become the fourth largest craft brewery in the U.S., with two plants, about $250 million in sales, and more than 750 employees. It is also 100 percent employee owned and a top-scoring B Corp due to its sustainability practices and supportive worker culture. When you walk into New Belgium’s shiny new brewery in Asheville, North Carolina, one of the first things you notice is the art. Each of the hand-crafted tiled mosaics surrounding the stainless-steel vats has a different theme: water, mountains or hops. The bar, where you can taste one of their beers, is made from materials recycled from the abandoned livestock auction markets that occupied the property before New Belgium bought it and cleaned it up. The many pictures on the walls are whimsical collages made from materials found at the site. The next thing you notice are the bikes and the dogs. Bikes are everywhere: the gate to the brewery is welded together from bicycles, and bikes are parked around the building and inside the hallways. The dogs seem right at home, greeted on a first name basis with a friendly ear scratch by employees. The vibe is relaxed and collegial, with employees sitting on tables, playing ping pong, looking into microscopes or reading thermometers. Michael Craft — New Belgium’s ambassador — is clearly proud of New Belgium’s distinctive culture. Michael was one of ten employees from the original Fort Collins brewery who transferred to Asheville to bring the seeds of that culture — beer, bikes, fun, teamwork and stewardship — to North Carolina. “Culture is at the heart of New Belgium,” Craft explained, “but it is not static.” As the company has grown, it has innovated to maintain the fun feel of a tight, supportive community. The company uses open-book management, walking everyone through the finances at monthly all-staff meetings; employees share birthdays, anniversaries and other personal posts through the Mothernet, an internal website. The POSSE (ESOP spelled backwards), a democratically elected team of employees, works on community issues, from ideas for reducing water usage to a four-week sabbatical that was recently introduced for long-term employees. Craft explained that co-founder Kim Jordan was a social worker. Jordan believed that work could be fun and fulfilling and went about creating a culture that supported that belief. Of course, good work begins with fair wages, decent health care and work–life balance. But New Belgium goes far beyond that, giving out fat tire bikes to celebrate work anniversaries, hosting company-wide retreats, encouraging creative employee participation, and sponsoring lots of community event — like the famous “Tour de Fat,” a traveling beer, music and bicycle festival, with the motto “Get Weird,” that raises money for local nonprofits. New Belgium’s employee owners are proud of the company’s environmental record. Sarah Fraser, one of three sustainability specialists, explained that New Belgium has reduced its waste to almost nothing through composting, recycling, and reusing most of the raw materials that go into its beer. They monitor their water and energy use, and measure the carbon cost of their entire supply chain, including the bottles that hold their beer, the refrigerated trucks that deliver it, and the cardboard boxes its packed in. The result: New Belgian scores in the top 10 percent of B Corps for environmentally sustainable practices. New Belgium has reduced its waste to almost nothing through composting, recycling, and reusing most of the raw materials that go into its beer. Fraser is especially gratified by New Belgium’s choice of a former brownfield for their new Asheville brewery. They restored a polluted stream, and in partnership with the city, established a greenway along the river adjacent to the property so that employees could ride their bikes to work. The tables and chairs in their tasting room are made with wood and metal salvaged from the property, crafted by an artisan directly across the river from the brewery. And 90 percent of the brewery artwork was done by artists within a three-mile radius. New Belgium achieved LEED certification on all the buildings, including the brewery, tasting room and distribution center. Among those core values is a deep commitment to the environment. While an outside buyer might have jettisoned that commitment, New Belgian’s employee owners are motivated to protect those values and hold each other accountable to the firm’s continued success. So how did this Best of the Best employee-owned B Corp handle it when, in 2017, competition from other small craft beers and changes in consumer culture led to a slowdown in the craft beer market, leaving New Belgium with excess capacity? To stay competitive, in 2018, they made the hard choice to lay off 28 of their more than 750 employees. As Craft explained, because of the open-book management and monthly business meetings, all the employees understood the situation. “It was still hard to have to let people go. But in the end, we are all vested and we want to see the company succeed,” he said.